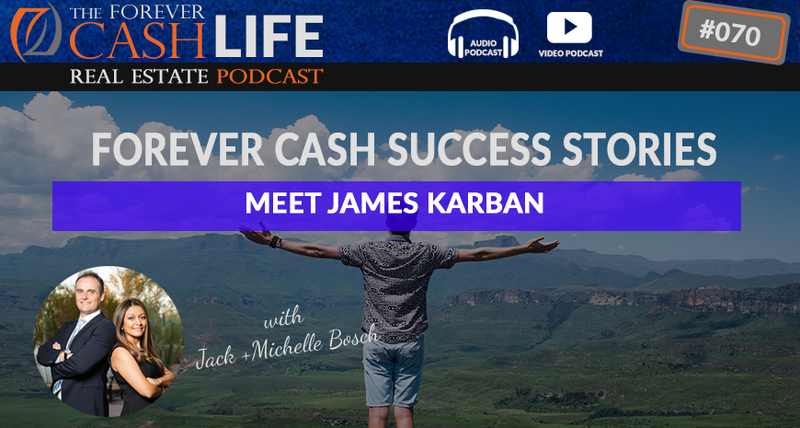 Jack Bosch talks to James Karban, a Forever Cash student who has now started coaching a group of his own students! In this episode you’ll get some insider perspective into the life of an active land, learning about some of the jaw-dropping deals James has done. You’ll also discover how James has tweaked the Forever Cash system to suit his own needs and leveraged his skills to become a successful land flipper. If you’ve ever wondered “what is it like to be financially free?” this episode is for you! Man: Welcome to the Forever Cash Life Real Estate Investing Podcast with your host, Jack and Michelle Bosch. Together, let’s uncover the secrets to building true wealth through real estate and living a purpose driven life. Jack: All right. Hello, this is Jack Bosch, and welcome to today’s episode of the Forever Cash live video and audio podcast. If you’re listening to this on YouTube, if you’re watching this on YouTube, we do have an audio podcast on iTunes, and if you’re on iTunes, go over to YouTube and watch the episode on YouTube, too. Right? Just looked for Jack Bosch or for Land for Pennies and you’ll find us. And this is the Forever Cash Live Real Estate podcast. Today’s guest is actually one of our own, James Karban. He is one of our mentors in our land program. He’s also a very highly successful real estate investor himself, otherwise, he wouldn’t be one of our mentors, right? And he lives in Florida and he has been really doing amazing, greatly wonderful things in the real estate space. So with that, I wanna say welcome. James, can you hear me? Can you see me? James: Yep, I see you. Thank you. Jack: All right. Wonderful. So great to have you here. How is life in Florida right now? James: It’s actually, lovely. We’ve got some lovely weather and hopefully, it carries through for the Tampa event because it’s just been great. Jack: Wonderful. Yeah. So we’re doing this in the beginning of the year here. So we’re in this freezing cold, everyone else. And it’s not in Florida. Neither is it in Arizona. We actually had a good couple of days right now. It’s been a cold winter. But anyway, James, tell us, so you are doing land flips, but tell us a little bit about you. Tell us your story. How did you get started, where you’re from, when did you get started in real estate, and also why did you get started in real estate? Why did you pick real estate? James: Sure. I’m originally from Michigan, spent some time in the navy out in California, I joined that after high school, got into the tech scene out in California. I became a webmaster right around 1999 or so, so I’ve been doing that for about 20 years. My specialty’s been search engine optimization. I’ve always looked at real estate as a great investment vehicle. Didn’t know much about it, but I ended up here in Florida, so I got licensed in 2013 to learn more about it. You came and spoke to our REEA back in 2014 and that’s when I bought into your program. I was currently in some other creative real estate programs and things like that and just land seemed to be a good fit for me personally. And largely because you talked about no tenants, no toilets, and no termites, right? I mean it’s three [inaudible 00:02:57]. It just seemed to be a good fit for what I wanted, especially with my busy schedule. I was in a startup, I was taking care of my dad, I was in a relationship, I was also sick, but I started doing deals in 2015. Got my first properties under contract in 2015. Had some killer purchases. Bought one for $4,000 that the seller paid I think $94,000 back in 2005 or 2006. So they took a $90,000 loss on their property. I feel bad for those people that did that, but they were smart enough to move on and write that off as a tax loss. I signed up for the coaching in 2016 and, you know, learned a whole lot more there. And, you know, it was a fast track acceleration to becoming successful. You guys asked me to become a coach, you know, in May of last year. So that’s been working out well. And then, I got my broker’s license in September of 2018. And, you know, basically, I’ve opened up my own company. It’s called Sell Land Fast. I do everything digitally because of my background in SEO. So I no longer send neutral letters for marketing. All my leads are organic and I always send a paper offer though. Jack: So what made you pick real estate over other things? James: The thing I like about real estate is that it’s more on my terms. I have more control over it. I know people that, you know, say, “Why don’t you do stocks or bonds or mutual funds?” And I don’t have any direct control over that. And you could say largely, you don’t have control over the market, but I know what I can buy for and if I buy things correctly, which is what we teach in the program is how to buy things right, you’re not gonna really lose money. Jack: Not that deal that you just talked about. What was it? It was worth how much or he had bought it for how much before? James: My big deal? The current one? They bought it for $94,000 and I bought it for $4,000. Jack: Now, jumping right into that. So we’re talking about land flipping here. So, I’ll go back to that deal in a little bit because I’m sure a whole bunch of people listening to that will say like, “Well, why in the world would they sell it so cheap?” But we’ll jump into that perhaps a little bit later. So first though, I wanna as like, so you picked real estate because you’re more in control and so on, but why land? You talked about the seller that I spoke about, no tenants, toilets, and termites, but I’m sure if you got your real estate license you were thoroughly brainwashed about houses. James: Yeah. Yeah. And, you know, the housing market is great. The thing is though is that you really have to work it hard. You have to be sending out letters on a regular basis and you have to be in the land business, too. The nice thing is the level of competition for land versus houses is such a big difference. Land is so much easier because there is less competition. Jack: For every 1 land guy there’s probably 1000 house guys. James: Yeah, exactly. And, you know, I’ve got friends that crush it in the house market and the amount of letters they have to do, the amount of promotions they have to do just to, you know, to get some deals is crazy. Jack: Yeah, I belong to Masterminds where I’m the only land guy and everyone else is house guys and they’re sending out relatively regularly, 100,000 plus letters or postcards a month. I mean, you haven’t sent that many out in your entire history and as you mentioned, you do it slightly different now, which we’ll might jump into in just a moment because… So, yeah. So houses, lands, so when you heard land, you basically, what did you hear when you heard land? James: I heard easier ways to accomplish the same kind of profit. You know, I had a creative real estate mentor tell me that, “When are you gonna stop doing these little land deals and start doing something where you can make significant money?” And one of my last big deals was $103,000 in profit. So I didn’t understand his question right there. Jack: And even if you try to convince, like “a man convinced against his will is of the same opinion still,” as they say, right? So, it’s like when somebody is talking about politics or religion or things that somebody is convinced one way, you can’t convince them another way, even if you show them a whole bunch of evidence or something and so it’s not even worth it. So now, I mean, yes, we teach as we go around the country, tell everyone, but I can only teach or I can only tell those who have their mind a little bit open to the possibility that there is something that is actually has the same profit margins, if not better than houses, but less competition, less hassle, less complexities and less work for that matter. I mean, not that there’s not work, but there’s less. James: Well, come to find out. It’s in my blood. My grandfather was a land banker, investor, and builder in Chicago. So. Jack: All right, there we go. Now we’re getting to the point, now we’re getting to the point. So, your mind was open because you had seen it work before by somebody that you probably look up to something. Jack: That’s a lot of money back then. James: Yeah. And he passed away before I was born, but they sold it in 1980 for like almost $4 million. So. He grew up in Yugoslavia as a German in Yugoslavia when the Russians came after the Second World War. He had to leave everything behind and literally just take a handcart and walk over to Germany. And so he started absolutely nothing, never made more than two grand, yet he owns this thing. And I was like, “How can you do this? Did you just not eat and just save every penny?” And as it turns out, sometimes I walk with my relatives to a shopping area of a larger town close by and my aunt goes like, “Oh, this is the hole in the wall that your grandfather bought right after the war and then he depreciated and he sold it.” But it’s like what? So the thing is, it was a house flip, but sometimes we don’t even know what people have done, but perhaps it was talked about in the family and it planted the seed right? And that seed then, when you hear the right message starts blooming. Anyway, wonderful. So, now, you’re doing land deals. So just to let everyone know the kind of land deals that we all are doing, James is doing, I am doing, is the same as house flips. So we like to pick a piece of land under $100,000 that the owners no longer want and that you can literally pick up for 5 to 25 cents on the dollar. What do you pay on average for a piece of land, James? James: That ranges, but it’s gonna be between 15 to 25 cents on the dollar. Jack: All right, so wonderful. And then you have developed a strategy, or typical strategies that we do send out letters, we just don’t have to send a fraction or we have to send only a fraction of what the house flipper send. But in your case, you have actually taken that and taken your personal expertise, and while you have done it the way we taught you and you’ve done very well with it, over time, you have tweaked it a little bit. Tell us a little bit about that. James: Sure. You know, my website ranks pretty well in Google and that’s where I get all my leads, but my offer package is a little bit different. I use the same framework, you know, that’s in the program, the land program. Jack: Let’s jump in one at a time for me. So you, instead of sending letters, what you’re doing is because you’re an expert in that area, you have optimized websites such that people who want to sell their land and they’re just randomly looking online and say like, “I want to sell my land” or thanks to certain keywords that they put in, your website pops up. Is that about right? James: Yeah. They usually find me through Google and then from there they go to my website, fill out a contact form, and I start communicating with them. Jack: Right? So, in essence, it’s a more, “Hey, I’m out there in the Internet waiting for you.” If they search for the right keywords, they find you. And the other approach is we’re getting a list from the county people that own property and we send them actively a letter. So one is a more of “Hey, guys, you own something, call us.” And yours is like when they go look for somebody to sell their land to, your website is ready. So it’s a very cool kind of different way. Not everyone can do what you’re doing because it requires that expertise, but it goes to show that. Now, let me ask you, when you started out with our land program, did you right away do it that way or did you first do it our way? James: No, I sent letters and to be honest with you, I think letters are easier. Jack: Okay. Well good. That’s good to know. But I like it still anyway, because what we teach our students, as you know, what we teach people is “First, do it our way. And once you’ve made it work our way and you’ve got a few deals done, now feel free to tweak it whichever way you wanna tweak it. And if you end up getting better results with your tweaks, go right ahead, continue that. If you don’t, you now always at least know you can come back to the original way and keep your deals going. I mean, is that your experience? Right? James: Oh yeah, absolutely. And I try not to deviate as much. It’s like you have a tested formula. So I didn’t change my contracts. I may have added something to it here or there, but whatever works, I don’t wanna reinvent the wheel. You already have a great wheel. I just wanted to maybe put some rims on for myself. Jack: Then again, there’s nothing wrong with that after you first do it, which is exactly like picture perfect example of how to do this properly. Do it the proper way first and then afterwards, once you have done a few deals, you adjust it to whichever freaking way you wanna do it. I love it. Love it, love it. So now you also adjusted your offer package a little bit. Tell us about that. So you guys, just to let everyone know, you’re listening to this. Typically though, what we do is we first send out the letter, Michelle and I have, my wife and I, we have created and tested, then split tested and optimized a letter that gets us anywhere from 5 to 50 and even sometimes 20% response rates on our letter, on the first letter without us having to send repetitive letters. And once we get those people to call us, we then do a little research and make them offers. So James, when you have an offer request come in, you do your research, what do you do different on the offers? James: Well, what’s interesting about that is, you know, when you sending from a list, you have things like legal description, an APN, stuff like that. So in our initial consultations, we need to get sometimes the owner of record and we need to do that research to put in the offer. So we’re doing some upfront research, to begin with. And what’s included is gonna be, again, your offer cover letter, that is from your system. We include the offer that is from your system. We use exhibit A and then I include a property analysis sheet that just, you know, puts in some zip codes and the county and the state, and makes it look like everything is in that area. And then we give them a few reasons why the offer is low and then from there we give them another sheet that is a tax loss deduction letter that explains to them that they may be able to write off the loss of that property and that they should consult their accountant with that. I give them an instruction sheet on how to send the offer back because believe it or not, people try to photograph stuff and email it to you. Like I’ve gotten photographs of the offer and my title company really doesn’t like that. So I wanna make sure that they get us the right paperwork back to us, the way it needs to come back to us. And then from there, I include a business reply envelope, which is just a postage permit that says “No postage necessary if mailed in the United States.” And it goes to my box, then it gets scanned into the cloud, and then I can take that PDF and signed contract and send it off to the title company. Jack: Love it. Very systematically done, very nicely done, very professionally done. And I also like that little feature with the postal permit, because in the past, when we sent out offers, we used to include a prepaid envelope where we put an extra stamp on it. Meaning you actually have to buy the stamp and put it on there. What you’re doing is actually, you got a permit that you preprint on there and that’s your permit number on there and you only pay postage when somebody actually uses it and sends that thing back to you. It’s a cost saver. So it’s a very good deal. Jack: And I look big? You know, I look [inaudible 00:17:25]. James: Yes. And you look like a professional company, which is actually another thing that when you do deals, you like to look like a professional company, not just like a mom and pop down the road. Jack: And it’s the same here because I think that has something to do with psychology. Like I never will get, when somebody, like I get these letters. I live in a pretty nice house and I get a letter, a handwritten letter on the kind of like a semi crumpled up, little piece of paper that says, “Hi, my name is Jim and Susie Smith, I live here and there and I want to buy your house. And I wanna make you a real offer and blah, blah, blah, blah.” And I’m looking at that thing and it’s like, “Hey, this is a pretty expensive house. If you wanna pay cash for this house, how come you don’t have a printer to print your letter in?” So I’d much rather respond to a company that looks very professional, that looks like there’s some funding behind the scenes, so it actually looks like they’re gonna go through with their offer. James: It makes you question the transaction, right? James: You question the transaction? James: Can these people really pull the trigger and buy this house? You know, if It looks like they can’t, then they’re not gonna contact you. Jack: Exactly right. And that goes contrary to what a lot of people do there. Yes, it’s about getting the people’s attention, but it’s also about getting them to believe and trust that you will follow through on the deal and you will give him the money that you promised to give him. And so both James and I, we go and also we recommend that in our landprofitgenerator.com program, that we go about this in a professional way and we portray ourselves as very professional, from the very beginning, no matter if you have not have done a deal before. So now, like, how many deals a year do you do now? James: I’d say I average 50. I’m still working on my systems. Jack: Fifty deals, when the guy says, “When are you gonna start doing some house deals?” That’s funny, right? Like, show me a bunch of house flippers that do more than 50 deals? James: Well, you know, it is nice though. Sometimes I do get houses from my website. I just pass it off to a friend last summer. It was like one deal, it was maybe five minutes worth of work and I made $6,500. So I mean, in that regard, it’s pretty profitable. Jack: No, that’s very nice. James: I’m not spending my time there. [crosstalk 00:20:00] on house deals. Jack: Right, exactly. And I would never say you can’t make money with houses. You can, of course, make a ton of money with houses. It’s just when you deal with land, you don’t deal with inspections and mold and termites and all this kind of stuff. That’s the thing. So very nice. So now you’re doing this full time, right? You do nothing else other than you came on board with us and mentor students. Now, how has that experience been for you? James: It’s been pretty good actually. You know, students are interesting. We’re all beginners at some point in time and some people come into the program and already in their second call, we’re talking about making offers. Then you have some people who may need a little bit more coaching or a little bit more skill developments and we’re on the sixth call and we’re just getting offers or neutral letters out because they’ve either found a shiny object that they were chasing or something like that. But for the most part, things have been great. Jack: Wonderful. Yeah, and that’s actually another funny thing. We have been so spoiled in our land flipping industry that when we talk about somebody that’s like down the road in the sixth call, which means they’re six weeks into it and they’re making offers. Like again, if you compare that to anyone else, I would wanna throw that out against anyone else there. Most people, after six weeks, they haven’t done anything yet. In our case, if somebody is not making offers by week, I don’t know, eight, then they have been dragging their feet and chasing shiny objects instead of actually working the system. And some, actually, literally as you said, do it in the second week. So, I find when I coach or mentor people that it’s actually rewarding, hopefully to them, too. And apparently so because they all make money, but to me, too, because I learn from them a ton, too. Has that been the case for you, too? Jack: We’ll figure it out. There’s a group of coaches, exactly, of mentors. Yeah. Wonderful. Great. So now, what do you think was… It’s a hard question. So what impact has real estate and obviously, land flipping, in particular, had on you? James: Well, I mean, there’s lots, I would say, one, financial freedom. Two, freedom of my time, right? Because we look at this in different ways, right? We have three basic ways of abundance, I guess. You have time, income and mobility. And when we look at those three things in our life, that’s truly what we’re looking for. I think when we are in the real estate market or just in the business of real estate. And the benefits, yeah, you can make good money, but your time can be your own and you can have the mobility to work from a lot of different places or to go travel or whatever you wanna do. So I would say it’d be those three free things. Jack: Wonderful. I mean at the end of that it’s about time, money, and the ability to spend that time and money with whom and where you want to. Which goes to the point of mobility. Right? Yeah. So, wonderful. So that’s all it’s about. So I’m excited. Now, you mentioned that before you got your real estate license, did you ever flip some houses or you just started the education and then came right into the land business? James: Oh, I did some house deals and you know, they were pretty quick and easy. I’ve had some commissions, you know, sold some houses, sold some condos. Right now I’m actually working on a certification for land specifically through the realtors and that’s gonna be for brokering really big, big deals like, you know, 300-acre farms and things like that. Jack: Yeah, because those deals come your way sometimes too, right? Jack: Yeah. Very nice. So, now let’s go back to that initial question. There’s a guy that bought a property for $94,000 and sold it to you for $4,000. Why in the world would anyone do that? James: Right. We solve problems. Jack: Great. So, yeah, I mean, I’m just literally today, I’m selling a property that I bought for $10,000, I’m selling it for $47,000. That’s a nice little deal, right? And getting another offer in for a property that we bought for $92,000 and we’re selling it for $220,000. So that’s a $128,000 profit. Then it’s a seller financing deal that will turn into a $250,000 profit. So these are deals that are happening on an ongoing basis right now. So why do people sell those? I mean, why does somebody do a garage sale and sell $100 bike for 10 bucks or $300 bike or grandmother’s cuckoo clock or whatever, watch, that is antique and worth $10,000 and they sell it for 50 bucks? Now they might not know that it’s that, but in many cases, they’re actually aware of what it’s worth, they just don’t want to deal with it. Why does someone need to sell a house that is absolutely livable for $50,000 below market value? You see that on television all day long. Why do they do that? Because they don’t have the vision to see what can be done with it. They don’t have the vision of looking at who is the best customer for that. They don’t know how to list the property. They don’t know how to make them look good. All of which is covered in our land profit generator program. So we have the link for it below. We put the link in the show notes. You can simply go to landprofitgenerator.com and check out the webinar and the things over there, but all of this, the exact details of how to get these deals and how to list them are available right there in that program. So now, James, one last question that you have. Now you have gone through, two questions. You have gone through mentoring yourself, and now if you compare, what do you think would have been your trajectory having not gone through mentoring versus having gone through mentoring? Jack: Well, sometimes it might take you a week to figure out, you can figure it out in five minutes. James: Right, exactly. It was the speed. Speed was a big thing. Jack: Wonderful. And now having said that, how fast would you have been able to crank up? You said there’s a time savings. Can you quantify that in any shape or form? I was like, I know for example, that without having even a course, if anything, because Michelle and I came up with this program, it took us three years of dabbling and trying back and forth to make this work. Once we made this work, we went from 0 to a $1 million dollars in profits in 18 months. Right now, some of our mentors are beating us to that. Some of our students are beating us to that. And yet, I see the people who are not in a mentorship, and they are regularly taking two to three years to get up on their feet and the ones in mentorship, they are up in their feet in three to six months. So, since you have done deals before, is there any quantifiable thing that you can put together? It’s like because of it, I think it saved me X amount of time or so? If not, no big deal. Jack: But it didn’t accelerate your ability to do deals, it accelerated the ability to do more deals in the same time and therefore, obviously, making more money. Now, how much do you think on the average deal, what’s kind of the range that you make on an average deal, then on a high deal? James: That just depends. Like I’ve done some really big deals, but the average I say would be about four or five grand on [inaudible 00:30:54]. Jack: higher end deal would be? Jack; What, so 4 to 50 grand. Nothing wrong with that. You can definitely pay your bills with that. Especially if you do like 50. Now, everyone can do their own math now and calculate what the range of your income is. Right? But I hope that’s okay. But the point is, even if you take the bottom end of that, it beats most people with a salary. James: Well, what’s interesting too is that my fiance got angry at me when I did this deal in St. Cloud, Florida where we made the 50 grand. I made 50 grand after, you know, everything was said and done, paid back investors and whatnot. And she realized that that was her salary pretty much for the most part for a whole year’s worth of work that took me five or six hours worth of work. Jack: And that’s the thing. So wonderful. James: She’s coming to the event now. She’s coming to Tampa. So. James: My daughter just signed up with us to do a deal. She took some student loan money that she’s got, you know, she doesn’t have to pay it back right this minute. And she gave us like $2,500 and we did a joint deal. We bought it for 5 grand and we’ll sell it for probably 25 and then we’re gonna split it 50-50, you know. So it’s great. It’s trickling down in the family and she’s a finance major. She sees the numbers, she knows, she knows that she doesn’t wanna have to work for her money. Jack: Absolutely. Wonderful. Awesome. So man, thank you very much for being here in the podcast with me. I hope you all enjoyed it. James, just one last question I have for you. Do you have any kind of parting words that you would leave with us? Give you a couple of seconds to think about it. In the meantime, again, if you want to hear about, learn about what we’re doing here, you can just simply go to landprofitgenerator.com or you can call our phone number, (602) 712-0182. Again, (602) 712-0182. We’re putting both of these numbers and links into the show notes. Or if you’re watching this on YouTube, underneath this video you should find them. And so I’m excited to have had James on the podcast here. Thank you much, James. And do you have any kind of parting words that you wanna impart to us? James: Yeah, I just tell you right off the bat, guys, don’t let fear stop you. All right, take action. Because that’s really where it’s at. Get in line and stay in line, and then just keep going. Jack: Wonderful. All right. With that, thank you very much. My name is Jack Bosch. Thank you, James, for being on the line with us and we’ll see you next week or as soon as possible on the next “Forever Cash Life Real Estate Podcast” with Jack Bosch. Right? Bye-bye. Man: Enjoyed this episode, then make sure you like, subscribe, and post your comments and questions below the video. We’re looking forward to hearing from you.